The Radeon HD 6450 is the scrawniest of the new arrivals, featuring 160 stream processors, 8 texture units, 512MB or 1GB of GDDR3 or GDDR5 VRAM, and a 64-bit memory interface. The GPU can be clocked from 625 to 750MHz while the memory runs from 533 to 900MHz. 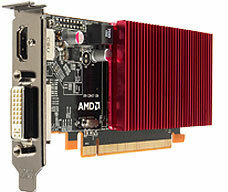 The HD 6450 appears to be aimed at low-powered machines such as HTPCs, given its low-profile, passively cooled design. Meanwhile, Radeon HD 6570 is clocked at 650MHz with 480 stream processors, 24 texture units, 2GB of GDDR3 or 1GB of GDDR5 memory running at 900 or 1000MHz along with a 128-bit memory bus. The 6670 has the same specs, except it's limited to GDDR5 and its graphics clock is 150MHz faster. We aren't sure what AMD and OEMs have in mind for these cards, though we imagine they'll mostly appear in entry-level machines. We wouldn't be surprised if they're passed off as budget gaming cards too.